Florence Mabel Harding (née Kling; August 15, 1860 – November 21, 1924) was the First Lady of the United States from 1921 to 1923 as the wife of President Warren G. Harding. She married the somewhat-younger Harding when he was a newspaper publisher in Ohio, and she was acknowledged as the brains behind the business. Known as The Duchess, she adapted well to the White House, where she gave notably elegant parties. She was born Florence Mabel Kling in Marion, Ohio, the eldest of three children of Amos Kling, a prominent Marion banker of German descent, and Louisa Bouton Kling, whose French Huguenot ancestors had fled religious persecution. Aiming to become a concert pianist, Florence began studies at the Cincinnati Conservatory of Music, but at 19 she eloped with Henry Atherton ("Pete") DeWolfe (4 May 1859 – 8 March 1894) and they were married in Columbus, Ohio, on January 22, 1880. A record of the issuance of their marriage license was printed in The Marion Star. Florence gave birth to her only child, Marshall Eugene, on September 22, 1880, but the couple separated not long afterwards, and were divorced in 1886. In 1890, Florence became engaged to Warren Gamaliel Harding, owner of the Marion Star, who was twenty-five, her junior by five years. They married on July 8, 1891, opposed by her father, who thought Warren was social climbing. They had no children of their own, but Florence's son Marshall lived with them intermittently, and received encouragement from Warren to work in journalism. During her husband's illness, Florence became business manager of the Marion Star,', immediately demonstrating both the talent and the character to run a newspaper. She organised a circulation department, improved distribution, trained the newsboys, purchased equipment at keen prices, and installed the first local news-wire service. One of the newsboys, Norman Thomas, later the Socialist presidential candidate, declared that Warren was the front-man, but Florence was the real driving power of the Marion Star. In 1905, Florence needed emergency surgery for nephritis ('floating kidney'), and was treated by homeopathic doctor Charles E. Sawyer. His close links with the Harding family, and Florence's total trust and dependence on him, would later prove controversial. During her convalescence, Warren began an affair with a close friend of hers, Carrie Phillips. It was one of a number of dalliances, which led her to consider divorce, though she never pursued it. By 1914, Warren's political career had taken him to the Senate, greatly helped by Florence's management of his finances, social life and public image. By 1920, he was a contender for the Republican presidential nomination, though not a front-runner. Florence gave him keen support, apparently influenced by a Washington clairvoyant 'Madame Marcia' Champrey, who correctly forecast that Warren would become President, but added that he would die in office. The election was overshadowed further by attempted extortion by Carrie Phillips, threatening to reveal Warren's adultery. However, Florence's newspaper experience gave her an advantage over other candidates' wives; as Henry DeWolfe was dead, she was able to deflect press inquiries about her first marriage by implying that she had been widowed. She also earned the approval of ex-President Taft. On March 4, 1921, Florence Harding became First Lady, immediately taking an active role in national politics, at times even appearing to dominate the President. She had a strong influence on the selection of cabinet members and, at the inauguration, observers believed that she was prompting her husband with a speech she had written. Florence made her views known on everything from the League of Nations to vivisection, racism and women's suffrage. When Madame Curie visited the White House, Florence praised her as an example of a professional achiever who was also a supportive wife. Florence's own special agenda was the welfare of war veterans, whose cause she championed wholeheartedly. In all of this, her timing was fortunate, as women's activism in public affairs was an important theme in 1920s America. As a White House hostess, Florence presided over elegant parties where her husband would refer to her as The Duchess. But she also moved with the times: flying in planes, launching new fashions like the silk neckband, showing after-dinner movies, and discreetly serving alcohol to guests during Prohibition. She was the first First Lady to vote, operate a movie camera, own a radio or invite movie stars to the White House. Florence was a friend and confidante of Evalyn Walsh McLean, the high-profile heiress and socialite. The Harding Tomb in Marion, resting place of Warren and Florence Harding. The white marble structure was the last of the elaborate presidential memorials. By 1923, both Florence and her husband were suffering from dangerous illnesses, but still undertook a coast-to-coast rail tour, which they called the Voyage of Understanding. Florence proved highly popular at their many scheduled stops, but Warren was visibly ailing. After falling seriously ill while visiting British Columbia, Harding died at the Palace Hotel in San Francisco on August 2, 1923. On this tour, Warren had been under the care of Charles Sawyer, who is believed to have misdiagnosed the President's condition, and administered stimulants that brought on his fatal heart attack[dubious – discuss]. As Florence did not request an autopsy, and also destroyed many of his papers, a conspiracy theory was put forward in a semi-fictional book The Strange Death of President Harding, sensationally claiming that Florence had poisoned her husband, a suggestion that has been almost entirely discredited. Florence had intended to make a new life in Washington, and was planning a tour of Europe. But when her kidney ailment returned, she followed Sawyer's advice, and took a cottage in the grounds of his sanitarium in Marion. Her last public appearance was at the local Remembrance Day parade where she stood to salute the veterans. On November 21, 1924, she died of renal failure. Her grandchildren, George Warren and Eugenia DeWolfe, were the principal heirs to her estate. Until the completion of the Harding Tomb, her body lay with that of her husband in the common receiving vault at Marion's city cemetery. 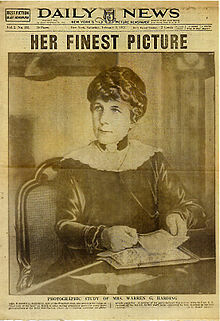 ^ "First Lady Biography: Florence Harding". Canton, Ohio: National First Ladies' Library. Retrieved 2013-12-26. ^ The Harding Memorial, Harding Home, 2010. Accessed 2013-09-24. Wikimedia Commons has media related to Florence Harding.